At Nebraska, the basketball program has been the perennial side kick, a winter side show that serves as a brief distraction in between football seasons. 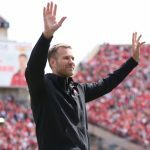 However at Nebraska’s spring game on Saturday, all eyes turned to Fred Hoiberg, Nebraska’s brand new head basketball coach. Hoiberg said that since he was officially announced as head coach on March 30th, he has spent the vast amount of his time out on the road, visiting with players and recruits. He also just finalized his staff on Friday, which will include former NU basketball head coach Doc Sadler as one of his assistant coaches. “The great thing about Doc is that everybody is more excited to see him than me now,” Hoiberg joked. Hoiberg cited Sadler’s reputation as a defensive guru as one of the driving factors that made Hoiberg want to reunite with Sadler. Hoiberg has also retained the services of Armon Gates, who joined the Huskers from Northwestern, where he had spent six seasons as an assistant. He’ll be important in bridging the gap with recruits, like 2019 signee Jervay Green, and current players like Isaiah Roby, who now have decisions to make since Tim Miles has been fired. Gates and Sadler will join Matt Abdelmassih, formerly an assistant at St. John’s University and a member of the Minnesota Timberwolves front office. Additionally, longtime head coach Bobby Lutz will be on staff as a special assistant. Most recently, Lutz was a member of the Windy City Bulls coaching staff. The situation for next season is far from ideal, though. Isaiah Roby could be on his way out to the NBA. Thomas Allen has already departed. James Palmer Jr., Isaac Copeland, and Glynn Watson Jr. are all seniors and have exhausted their eligibility. However, hope springs eternal for the Nebraska basketball program. It’s no wonder, given that Hoiberg is coming in as the most accomplished head coach in program history.